After having played bad poker for the last two months on the PP leaderboard (I only cashed in the first week, and the very last tournament of the series), things have taken a turn for the better, now I'm back playing my regular style (for some reason I got nowhere with that in the leaderboard games, and started to make all sorts of counterproductive adjustments; despite that still managed an 11th place overall to my surprise). Congratulations very nice results first of 438 is a very good achievement and also good for a BR. Cashing in three tournaments with good money considering the buy in of these tournaments it is really nice for you and your confidence that you had lost a little bit in these leaderboard games. Just go for it you are in a good period. Marqis. You seem to be running well lately and should do all you can to keep up this good spell of play. It's also nice when you start pulling in nice tidy sums of money for your efforts also. I'll be looking out for you in tonight's leaderboard game and seeing how you do in that. Good luck. Good fellow. My congratulations. 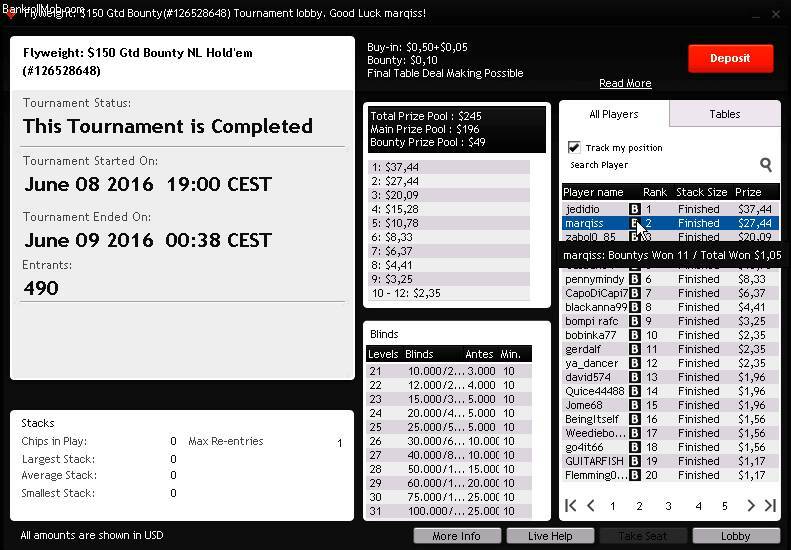 I had recently similar tournament, but from bainy $11. I won back not in the best way. And such sweet prizes were... I congratulate, I wish good results and victories. Gratz, verry good run in the last days But the freerolls are verry heavy to play...you can be a good or serious player, but there are a lot of maniacs which go all in in every hand and so it was not so easy to play sometimes. My genuine congratulations on your remarkable winning! Your determination to reach your goal has been commendable. You remind me of the meaning of hard work and integrity. You have prodigious talent and potential, and I am confident in your ability to duplicate success in the future.